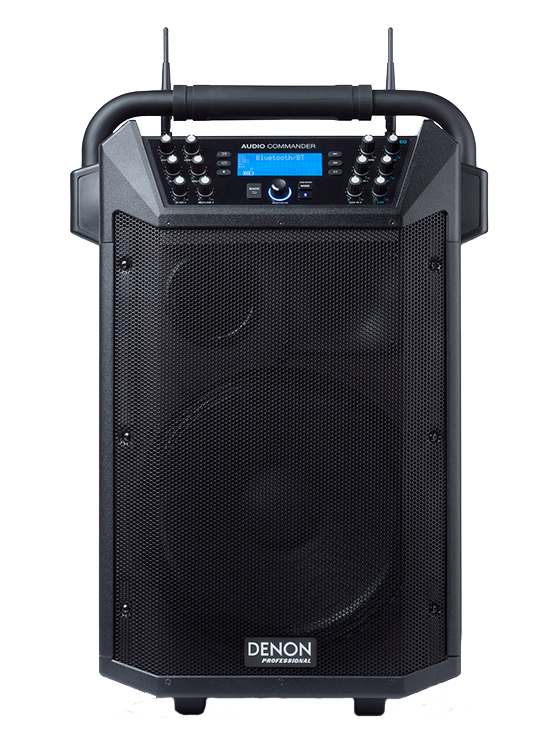 The Audio Commander is an all-in-one compact PA system designed to satisfy the needs of customers such as professional DJs, aerobics instructors, presenters or anyone needing a self-contained, self-powered unit without cables. This article answers the most frequently asked questions about the Audio Commander. What is the battery life? Can I replace the battery myself? How big the Audio Commander? How do you pair and change channels with your wireless microphone? How far can your wireless microphone and your wireless belt pack transmitter pair? Can I use two handheld microphones rather than the headset microphone? What are the specifications of the speaker system? Can I put this on a speaker stand? Can I link two Audio Commanders Together? Can you use a third-party lavalier microphone with your Audio Commander? Does the wireless microphone system meet the new FCC Frequency Band? The Audio Commander is going to sleep on its own. What do I do? Who do I contact for further technical support? The battery on the Audio Commander will last around 8 hours at half volume, and around 3 hours at full volume. The battery should be charged for about 8-10 hours to reach a full charge. The Audio Commander battery is a 12V DC, 12 Ah lead-acid battery that is easily-replaceable, should it ever need to be changed. Use a Phillips-head screwdriver to simply remove the panel on the bottom of the Audio Commander to remove and replace the battery. Ensure 2 new AA alkaline batteries are installed in the wireless microphone. Pair the wireless microphone (found in the side compartment) to W. Mic Receiver 01 on Audio Commander. Turn on Audio Commander and the wireless microphone. Select a channel with the best reception using the Up/Down buttons on the receiver. Place the wireless microphone IR sensor (found above the power button) near the place the wireless microphone IR sensor (found above the power button) near the receiver's IR LED and press the Set button on the receiver. Wait for about 3 seconds until the IR LED stops flashing. When it finds an interference-free channel, the RF LED will illuminate on the receiver showing the mic is matched to that channel. Adjust the wireless microphone gain using the W. Mic 1 knob on Audio Commander. As you speak, watch the AF indicator on W. Mic Receiver 01 to make sure a signal is being received. Note: Make sure to turn the Browse knob and select the appropriate W.Mic source. How big is the Audio Commander? The Audio Commander is 17.2" x 13.5" x 25.4" (width x depth x height) and weighs 47.8 lbs. The wireless microphone and belt pack transmitter can connect up to 100ft without obstruction. Yes! The Audio Commander includes one handheld microphone and one headset microphone. An additional handheld microphone can be purchased separately and paired to the second wireless channel on the Audio Commander. See our steps above to connect a wireless handheld microphone to a receiver. The Bluetooth range is 30ft without obstruction. The Audio Commander features a 200W RMS Class-D amplifier, 12-inch woofer, and 1-inch tweeter. The frequency response is 75 Hz - 250 kHz. You can use any generic speaker stand for use with this unit. Yes. The Audio Commander has a 1/4” TRS (6.35 mm) output which you can use to connect to another Audio Commander. Yes, the Audio Commander features (2) integral 16-channel UHF (584 - 608 MHz) wireless microphones meeting the FCC Standard. Please download and install the latest firmware update from the Audio Commander product page (linked below). This can be found under the Downloads tab and will include update instructions. This update will add an energy saving mode that will only kick in after one hour of no input through the Bluetooth, USB, or Aux inputs. Pressing any button will wake it up again.